Kuuma's rod holder mount enables you to turn any fishing rod holder into a grill mount. 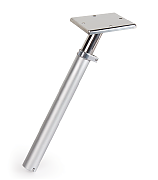 The rod holder mount has a 60 degree angle and an adjustable height. Fits into most rod holders with cross pins.